Comment: Expedited shipping available on this book. Book has been read but is in excellent condition. No missing or damaged pages. Maybe some identifying marks on the inside cover. Quality guaranteed from the largest seller of used books online. 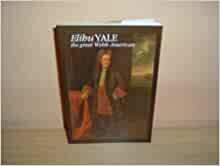 The story of the man who founded Yale University in America but whose tomb and epitaph are in Wrexham in North Wales. Published by the Wrexham Area Civic Society in 1991.